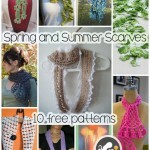 Wreaths for All Year: 12 Free Crochet Wreath Patterns! Wreaths aren’t just for Christmas anymore! Crochet, felt, burlap, floral – the choices are limitless, and so are the occasions. A quick browse through Pinterest or any other DIY site can overwhelm you with options! 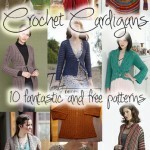 But you know what I like to focus on… free crochet patterns! 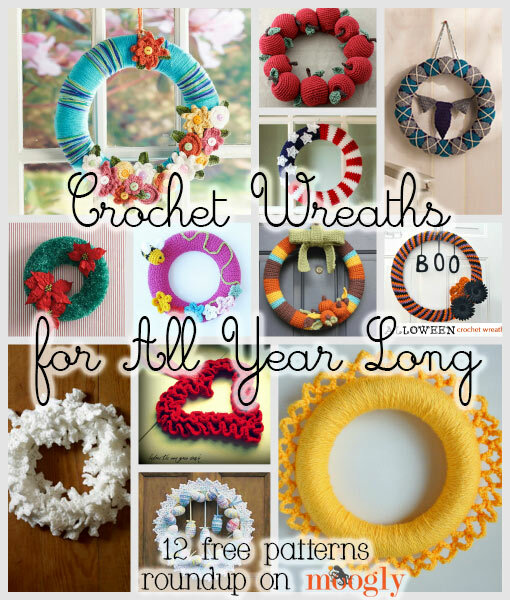 So here are 12 free crochet wreath patterns – 1 for every month of the year! Holiday Leaves by Lion Brand Yarn: They may be leaves, but in all white they look like they’re coated in fresh snow! 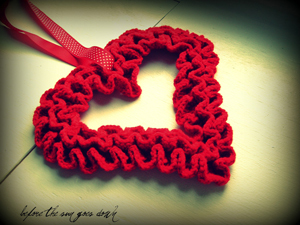 Sweet Ruffles-A Crochet Heart Wreath by Grace Ann, on Would You Like Yarn With That? : Gorgeous and love-ly! Happy Easter by Lily / Sugar’n Cream: Pastels, ribbons, eggs, and lace! 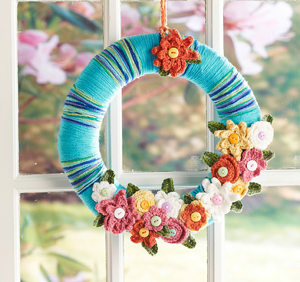 April Flowers Wreath by Sharon Mann, on Red Heart: A simple wrapped wreath with a wealth of crocheted flowers – love the colors and button accents! 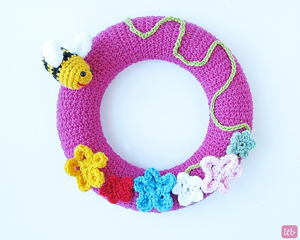 Crochet Spring Wreath by Little things Blogged: The May flowers are in bloom – and I adore the little bee! Argyle for Dad Wreath by Sahrit Freud-Weinstein, on Red Heart: Honor dad on Father’s Day – or leave off the tie for a chic patterned wreath any day! American Flag Wreath by Kara Gunza, on Petals to Picots: A perfectly patriotic wreath, this one is easy to customize in your own country’s colors if you’re not USian! 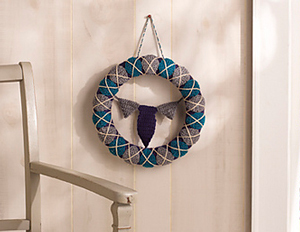 Simple Statement Wreath by Lisa Gutierrez, on GoodKnits: Simple and elegant – and easy to embellish if you so choose! I love the bright yellow one pictured here, made by Ravelry user caseyplusthree – like the bright hot sun of August! Apple Wreath by Lily / Sugar’n Cream: Celebrate the start of the school year – or apple pie season! 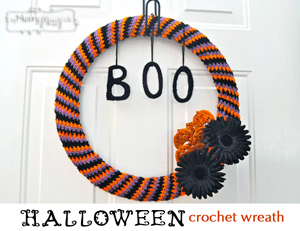 Halloween Crochet Wreath by Sara McFall, on My Merry Messy Life: A fantastic mixed media wreath that’s not TOO scary. Perfect as is if you’ve got sensitive souls to worry about – and a great base for adding your own personal, far more terrifying touches if desired! 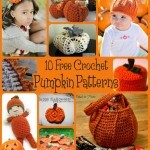 Crocheted Fall Wreath by Sarah Zimmerman, on Repeat Crafter Me: I love the colors, the pumpkins, the leaves – I love fall, and this wreath has captured it perfectly! Christmas Wreath by Bernat Design Studio: There are tons of holiday wreath patterns out there, but I really like the simple, classic look of this one. Boa yarn has found it’s home here! 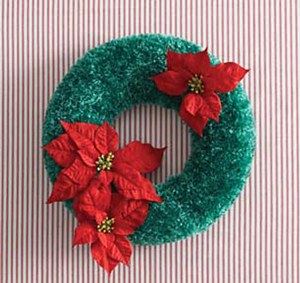 Do you use wreaths to decorate your front door? What about the interior of your home? 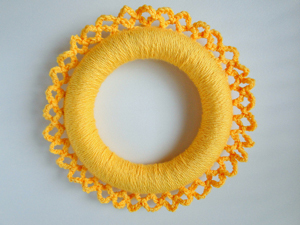 Have you crocheted a wreath before? 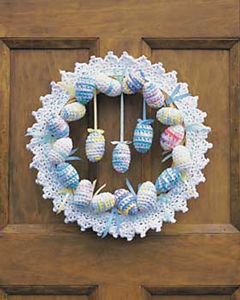 Have a favorite crochet wreath pattern you didn’t see here? Share in the comments! 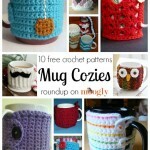 10 Free Patterns for Marvelous Crochet Mug Cozies! 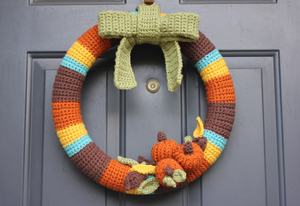 Never really got into the yarn wreaths – I’m more of a traditionalist with wreaths I guess…but that sun one may just convert me – that is SO cute! Great, now I have an even bigger list of things to make. You are such an enabler! I’ve used the base of the Simple Statement Wreath, before adding the extra edging part, to create several wreaths using ruffle and lace yarns. They came out better than I’d hoped 🙂 and they’re so much fun to make! 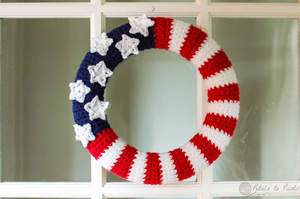 Now that Red Heart has come out with a red, white and blue Sashay ruffle, it’s time to make a 4th of July wreath for my door. Oh I bet that will look fab! 😀 Thanks Diane! I love these! I made a variation of the argyle wreath for Valentine”s Day. Then I crocheted a St. Patrick’s Day wreath using the fall wreath as inspiration. (No pumpkins! 🙂 ) I’m currently crocheting a yellow sun wreath with 3 dimensional rays. I like these smaller wreaths for inside. 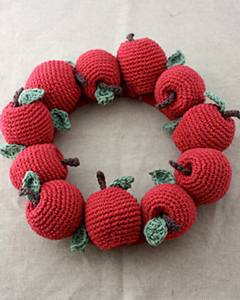 I want to make the apple wreath but can’t find the web site. Cute stuff. Is there any chance we can make a nautical inspired wreath? 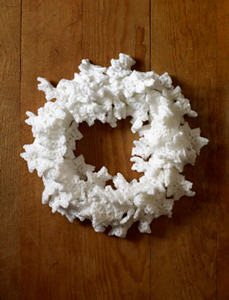 My grandmother taught me how to make a crocheted.Christmas wreath made around the edge of a cool whip lid (the flat part of the lid cut out). Are you familiar with this???? Hi Angela! I can recall seeing stuff like that when I was a kid (and didn’t know how to crochet) – but I can’t seem to find anything online about them! How funny!